An Easter egg hunt near Gilroy that was supposed to raise money for veterans’ service dogs was canceled at the last minute over a permitting issue, and the organizer is blaming the county. 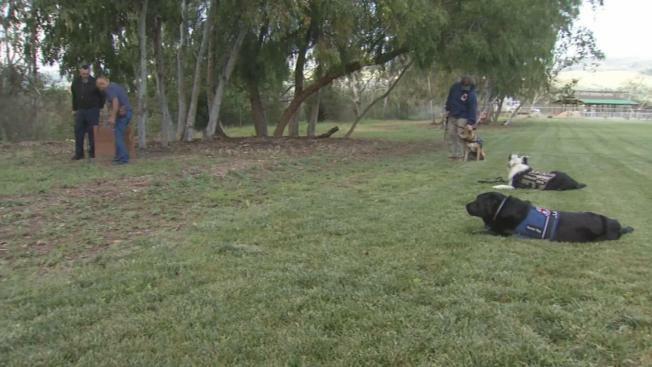 Operation Freedom Paws in San Martin, which trains canines to become service dogs for veterans with post-traumatic stress disorder and other needs, prepared to host an Easter egg hunt last week to raise money and awareness. The funds were to go toward the costly training of the dogs, which runs upward of $15,000 for each pup but is provided at no cost to the eventual owner. Founder Mary Cortani said the day before the event, the Santa Clara County planning department called to say the group didn’t have a permit to host an event. Cortani feared a complaint could jeopardize their pending permit to expand services at the center. She plans to host more classes and wants to increase the number of dogs allowed on the property at once above 70. Cortani took the call as a threat. “As the conversation proceeded, I became concerned,” she said. As a result, Cortani canceled the Easter egg hunt. She says she called 150 people who RSVP’d and refunded them. The Santa Clara County associate planner who called Cortani told NBC Bay Area she reached out as a courtesy, and it was not a threat. She added the nonprofit did not have the required permit, which could result in a code violation if someone complained. Cortani disputed they even needed a permit to host on their property. Cortani says the organization lost a few thousand dollars from the cancellation.